Grass tetany, or hypomagnesia, is a nutritional disease that can occur in cattle grazing lush and actively growing cool-season grasses that have been fertilized with nitrogen and potassium. This disease is caused by the inability of cattle to absorb magnesium, a mineral involved in many metabolic reactions, from feedstuffs to meet their needs. 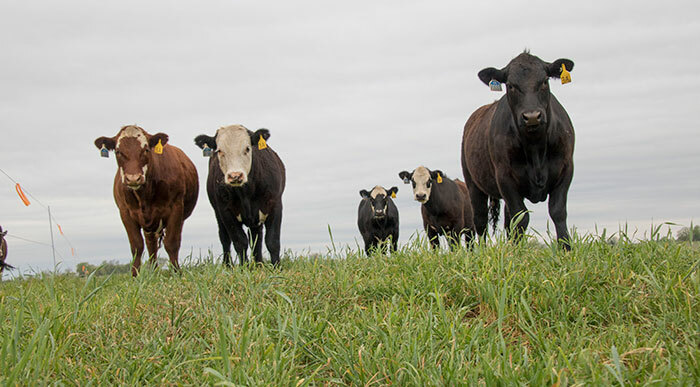 Kim Mullenix, Auburn University extension beef specialist, addresses the symptoms and causes of grass tetany as well as how to prevent it in an Alabama Cooperative Extension Service (ACES) bulletin on this common spring-grazing health issue. Grass tetany occurs most often in lactating beef cows, more so during peak lactation, but older cows are more susceptible than younger ones. “This is because the body reserve of magnesium, found in bones, may be less in older animals,” Mullenix explains. While symptoms may not be noticeable at first, signs of nervousness, excessive salivation, muscle tremors, and rapid breathing may indicate the onset of grass tetany. In more acute cases, cattle will collapse, go into convulsions, and eventually die. • Cereal crops like wheat, rye, and oats have a low magnesium content, especially in the spring and fall. • Low soil magnesium content leads to low magnesium content in plants. High levels of other elements such as potassium inhibit the plant’s ability to absorb magnesium. • Forages in cold temperatures or cloudy weather that favor fast growth are low in magnesium. • A combination of low dry matter and high nitrogen content in forages leads to lower blood magnesium levels. Adding high potassium to the combination is even more dangerous. • Low forage and/or blood calcium levels can also cause tetany. To prevent grass tetany, properly balanced fertilizer and magnesium compounds can be applied to the soil to elevate plant magnesium uptake. Dolomitic limestone, which contains magnesium, can improve forage levels when you need to raise soil pH or if soil magnesium is low. Magnesium oxide can have the same effect. “All of these are helpful but are less economical and not as effective in preventing grass tetany as a direct supply of magnesium to the cattle,” Mullenix explains. “The real problem is not necessarily low magnesium content of the soil and plant but reduced absorption of magnesium from the digestive tract of the animal,” she adds. “Consider moving to a high-magnesium mineral one to two months before active grazing on lush forages begins so that adequate intake levels can be established,” Mullenix states. She suggests selecting a mineral supplement that contains calcium when grass tetany risk is high. Cattle need to consume 1 ounce of magnesium oxide daily and have their intake checked frequently. “Magnesium is not stored in the body so daily consumption is important,” Mullenix explains. Mixing equal parts of trace-mineral salt and magnesium oxide is another option for improving magnesium intake. Mullenix warns to not mix these with protein supplements or other high-nitrogen feeds as they only worsen tetany problems. To further elevate intake, include another equal part of a high-energy feedstuff, such as dry, rolled corn, which can overcome the bitter taste of the magnesium oxide. Other grains or dry molasses are also viable options. Treatment of grass tetany can be successful if started early and the affected animal is handled minimally. Since the recommended preparations and dosage rates vary widely, depending on the case and size of cow, Mullenix advises to contact your veterinarian as soon as symptoms occur. To download the ACES bulletin on grass tetany and review a salt-based mineral supplement for beef cows on cool-season grass pastures, click here.